The Wildfowl and Wetlands Trust's National Centre in Llanelli has excellent facilities that makeit a great place for a day out for the whole family. Covering some 450 acres, the reserve has a mosaic of habitats, including pools, lagoons and streams adjoining the saltmarshes and shore of Burry Inlet, in Carmarthenshire. The extended eastern part of the site forms the Millenium Wetland and was funded by various bodies within Wales. It has transformed an area of low-grade farmland into some important habitats for both birds and other wildlife, notably dragonflies of which more than 20 species have been recorded across the site as a whole. Although first impressions are that the Centre is mainly focused on birds, the variety of habitats make this resource home to so much more, including excellent plantlife, mammals and insects. 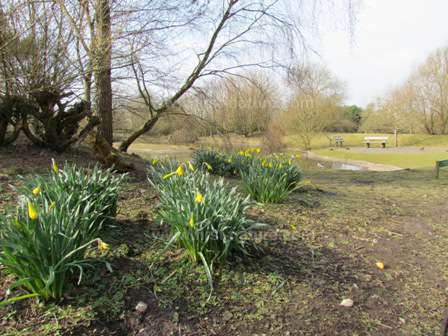 Anyone with a general interest in nature and wildlife will find this an absorbing and enjoyable place for a day out. 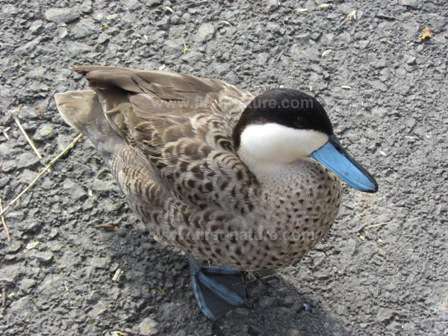 From the M4 motorway take exit 48 and follow the 'brown duck' nature reserve signs. This is one of our best-signed reserves and we have had no difficulty in finding it by using the signage. The Centre building is open from 9am to 5pm all year round, and in summer the grounds are open until 6pm. The cost (2012 rates, including gift aid) for entry varies from £8.45 per adult to £23.60 for a family of four. Children under the age of 4 are admitted free of charge, as are essential helpers for disabled visitors. Children aged between 4-16 pay £4.65. Under 16s must be accompanied by an adult. Paths throughout the reserve are level and consist either of tarmac surfaces or compacted gravel, and so they are ideal for wheelchair users and for people with prams or pushchairs. 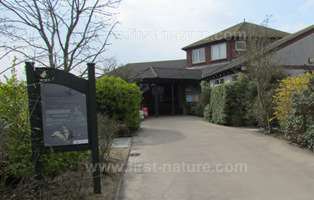 Below: The Visitor Centre and information boards close to one of the lakes. 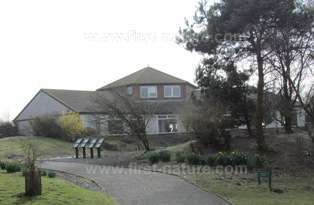 There is a Visitor Centre with public toilets, a gift shop and a fully licensed café, which overlooks the reserve. At various locations on the reserve bird hides have been sited. Activities available through the centre include canoe safaris; there is also a bike trail and a number of child-friendly facilities including the 'Swan's Nest Maze' and 'Vole City'. The complex and varied wildlife habitats at this centre are home to many wildlife species, including some interesting and unusual plants. 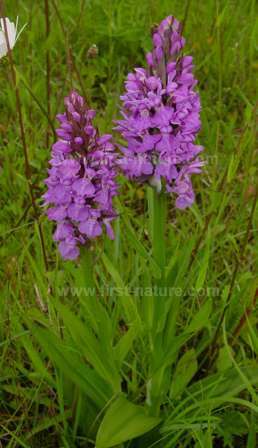 If you are keen on wild orchids a visit in June should enable you to find at least three species. Common Spotted-orchid (Dactylorhiza fuchsii) grows close to the centre, while slightly further afield there are both Bee Orchids (Ophrys apifera) and the gorgeous Southern Marsh-orchid (Dactylorhiza praetermissa). Yellow Horned-poppy (Glaucium flavum), a specialist coastal plant, is also present at the reserve; it is recognisable by its large clumps of grey-green leaves and the long, curved seed heads from which it gets its common name. This poppy is much rarer than it used to be and is now very localised in Wales and other parts of the UK. Pretty Yellow Bartsia (Parentucellia viscosa) is in the reserve, as also are Rock Sea-lavender (Limonium benervosum) and Marsh Mallow (Althaea officinalis). The wealth of wildflowers in this reserve means that the insect life is also abundant and diverse. Many butterflies have been recorded here on warm summer days. The reserve is also notable for its moth communities, some of which are now scarce throughout the UK; the Scarlet Tiger Moth and the Rosy Wave Moth have both been recorded at the Wildfowl and Wetlands Trust's National Centre, here in Llanelli. Mammals that live in and around the reserve include the Otter (Lutra lutra) and the delightful Water Vole (Arvicola terrestris). Otters are seldom seen, especially during daylight hours, but they have been very quick to seize on the opportunity presented by the well-fed fish stocks that live in the various lakes and lagoons on this wetland nature reserve. The Wildfowl and Wetlands Centre has visiting birds as well as resident breeding bird species, which means that a visit at any time of the year is bound to be of interest if you have an ornithological leaning. Breeding birds seen on the reserve include Moorhen, Coot, Redshank, Reed Warbler and Reed Bunting as well as Lapwing. In the past both Common Sandpiper and Little Ringed Plover have been known to breed there. Away from the estuary other birds also breed in the area - Kingfisher, Cuckoo, Barn Owl and Sedge Warbler to name but a few. Grey Herons can always be seen around the reserve, but in recent years, Little Egret numbers have increased dramatically as they have in other parts of the UK. Far more commonly seen in parts of Europe, it remains to be seen if these small white herons start to breed in these habitats that are new to them. In wintertime thousands of wintering ducks make an appearance in and around the reserve, the most numerous of which are Eurasian Wigeon and Pintail. Winter is also the time to listen out for the rare Bittern, which has been heard in the reserve from time to time. It is difficult to over-estimate the importance of this centre, which is right in the heart of a very important area for birds. Its presence there, and the recording work undertaken by the staff of the Centre, have contributed considerably to our knowldege of the birdlife of the Loughour Estuary.